On July 10, 2015, Sandra Bland, a politically engaged and vibrant 28-year-old African American from Chicago, was arrested for a traffic violation in a small Texas town. After three days in custody, she was found hanging from a noose in her jail cell. Bland’s death was quickly ruled a suicide, sparking allegations of a racially motivated police murder and cover-up, and turning her case and name into a rallying cry nationwide. From the Oscar®-nominated, Emmy®- and Peabody Award-winning team of directors/producers Kate Davis and David Heilbroner (HBO’s “Traffic Stop,” “Southern Comfort,” “The Cheshire Murders” and “Jockey”), SAY HER NAME: THE LIFE AND DEATH OF SANDRA BLAND examines this story in depth, revealing previously unknown details when itdebuts MONDAY, DEC. 3 (10:00-11:45 p.m. ET/PT), exclusively on HBO. While the Texas authorities ruled Bland’s death a suicide, providing photos of a noose made out of a garbage-can liner as evidence of the cause of death, questions were raised about why she was held alone in a cell without surveillance cameras, whether cell checks by law enforcement had been fabricated and why Bland’s body had been severely bruised. Attorneys in the film examine the disturbing police dashcam video of Trooper Brian Encina’s aggressive treatment of Bland after pulling her over for failing to use a turn signal. Fearing that she had been murdered, her mother and sisters filed a suit against local law enforcement and the Waller County jail as protests amplified across the country. SAY HER NAME is punctuated with footage from Bland’s passionate “Sandy Speaks” video blogs that bring her voice to life. Through the videos,as well as voicemail messages and insights from close friends, she emerges a central figure in the narrative, an engaging and enlightened woman whose sharp, humorous remarks address subjects from black history to police brutality to natural hair. To those who knew Sandra Bland best, suicide seemed unimaginable. Following a contentious legal battle, the family settled with authorities, giving rise to the Sandra Bland Act, which is now law in Texas. The Act mandates a host of prison reforms aimed at preventing inmate suicide, and a street in Hempstead, Texas has been named in Sandra Bland’s honor. 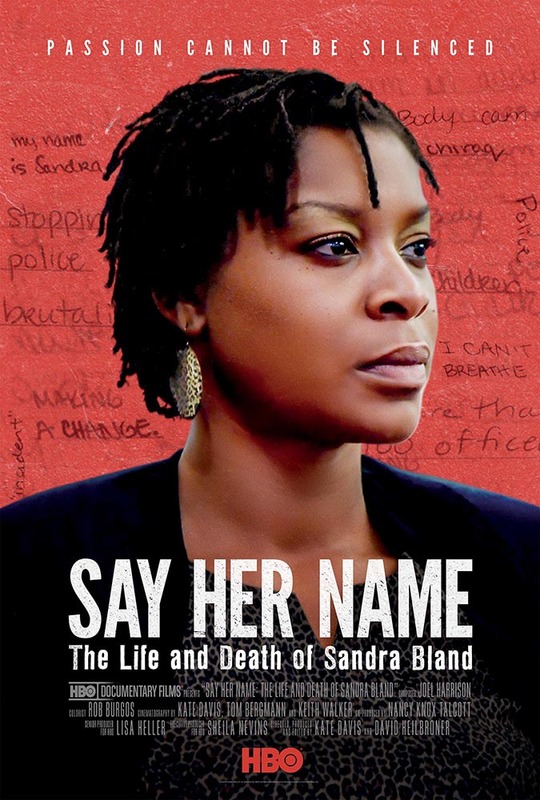 SAY HER NAME will have a limited theatrical run prior to its HBO debut. The documentary made its world premiere at the 2018 Tribeca Film Festival. It won Best of Fest at the Ridgefield Film Festival, and was nominated for awards at the Traverse City Film Festival, Chicago Film Festival, the St. Louis Film Festival and Nashville Film Festival, among many others.